"Online Results Still Aren't 'Corrected'"
My Tokyo experience was in some ways a dream and in others an unending nightmare. Packed pickup and the expo were relatively painless - anyone without Japanese language experience should have no qualms about this portion of the experience. We stayed very close to the start (just west of Shinjuku Station) which worked out very nicely as we could run directly south to Yoyogi Park for our shakeout runs and could walk to the start area. One aspect I didn't quite understand was the flow from entering the secured start area to the start line itself. Even through I was staying on the west side of the start, I actually had to enter from a specific gate on the east side, walk to gear check on the south end of the secure area, then make my way to the corral on the north end. Ultimately, this process was relatively painless, but could probably be laid out differently. The weather was near perfect with temps in the mid-40s, overcast skies, and just a touch of wind. In my 14 marathons, I can only think of two other times I've raced in such ideal conditions. I made the mistake of not pushing closer to the start line in the corral, an error that as you'll see soon I'd regret. As the race started, there was a lot of pushing and shoving as I believe there a lot of very competitive (fast) runners in the second corral. While the contact only lasted a short bit, the course was quite crowded for the first 5k. My friend Andrew and I ran the first 10k together and we were passing people pretty much from the start line. By 10k the crowds had thinned out and I was able to get into a nice rhythm. I found it helpful to have the race broken into kilometers - a fast pace was more digestible in smaller bites. Interestingly enough, I continued to pass athletes throughout the entire race, I'd pull up to a group, hoping they'd be running my pace, but would have to continue forging on ahead by myself. As the pain set in, I found inspiration in the seeing the athletes ahead of me on the out and back portions (there are three). My friend Javi mentioned the cobblestones in the final kilometer which was a good call out. With 5k to go, I knew I'd be very close to my goal of a sub-2:30 PR. I continued to break down the race by kilometer. Entering the last kilometer, it was nice to not be surprised by the wobbly footing on the cobbles. As I finished, I saw the clock had ticked just past 2:30, but I was pretty confident that my chip (net) time would be below 2:30. Fast forward to our post-race celebrations, hours after the race, I still only had a gross/gun time of 2:30:09 and no chip time. In our group of eight marathoners, three of us were missing net times, specifically because of failure to capture start time. I sort of knew that I had broken 2:30, but didn't feel confident about claiming it because the results didn't reflect it. Fast forward to several weeks later, the race posted official results (mine listed identical gross and net times) and finally provided their plan for resolving the missing start times: they would allow athletes to report when they believe they started providing the option of sharing another athlete's bib number as a reference point. Upon investigation, I realized that I started between my friends Andrew and Javi. Both of them had start times so I could deduce my start time within three seconds. There had been at least an 18 second delta between the official gun start time and when Andrew and I crossed the start line. This 18 second delta gave me my sub-2:30 (2:29:51), but I still had to wait for official confirmation to feel confident in claiming the time. 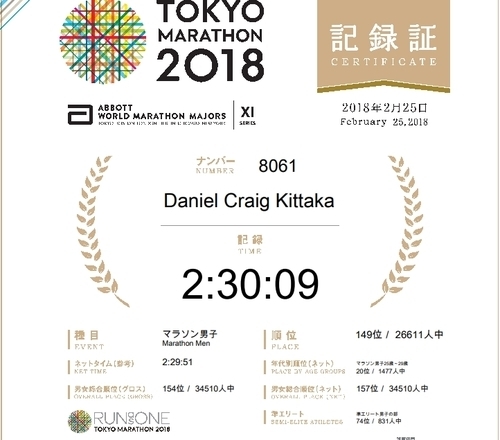 Fast forward yet again to April 6th (the 2018 race was February 25th), and I received an email in Japanese with a link to an updated finisher's certificate with my adjusted net time (see photo). Unfortunately at the time of this writing (April 13th, 2018), online results don't reflect this update. 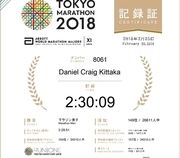 I'm not sure if this was a preventable error or not and I wouldn't ever tell someone not to run this race, but I certainly haven't come away with the best experience because of the timing issue that tarnishes my best ever run over the marathon distance. It has been exciting to see this race grow from a run with friends to a full-blown regular event on the Chicago racing calendar. The 2018 event was well produced - the heated Soldier Field United Club staging area is just steps from the Start/Finish, the course is fast and flat, and as of 2018 offers prize money which always helps elevate the level of competition. Packet pickup occurs for an entire week before the event in both the city and suburbs which is clutch - that said they ran out of men's smalls when I picked up which was admittedly very late (1 hour to go in pre-race pickup, haha). We lucked out a ton and got a 35+ degree day which yielded some fast times as we were able to express our hard-earned winter fitness on the flat, fast course. Despite being an out-and-back, I never felt like the course was too crowded. I also enjoyed the cheers of oncoming runners and the level of competition. "Why are the volunteers so happy? 'Cause this race has "gnome" in its name." It was super cold (single digits Farenheit) in 2018, but the volunteers and RDs were so happy - it was a pleasure to race. Also Veteran Acres is really pretty despite being a bit of a haul from Chicago-proper. Turns out Veteran Acres is also kind of hilly - the Midwestern kind of hilly where you shred your flat-land trained legs by short, steep up and downhills. There are plenty of nice amenities like a warming tent, plenty of aid station goodies, and a nice hoody with a gnome head on it. The last six men's marathon world records have been set in Berlin. In 2016, the great, Kenenisa Bekele, pushed by former world record holder, Wilson Kipsang, nearly broke the world record the seventh consecutive time at this iconic event. While I didn't run close to a world record, I will say that the event's heritage helps draw some of the world's best runners at every level. 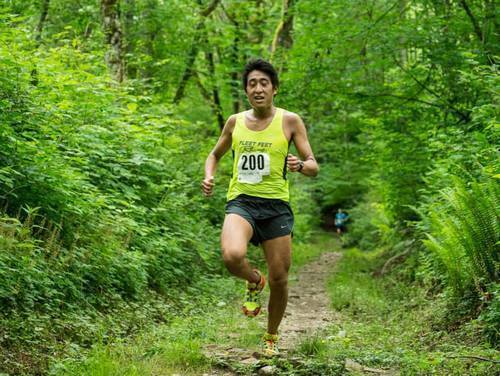 This competitive field combined with the pancake flat course and consistently comfortable weather are what make this event one of the best in the world for those seeking a fast time. Bib pickup and the expo location were straightforward - be prepared to cab or take the efficient U Bahn (Train). My main gripe with the expo experience was that the official Adidas merchandise booth was a complete mess - finding the perfect piece of apparel was like wrestling an octopus. The start corrals were no big deal - in fact it seemed like a pretty low key environment for such a big event - the corrals at Boston and Chicago are much more intimidating. Toss-away plastic ponchos were a nice amenity. The course itself was well supported by volunteers and spectators. I felt like there was pretty good crowd support and many different bands all over the course. I could see the plastic cups making footing a bit dicey depending on the traffic in your wave, but it was never an issue for me. I only took water so I don't have any comments on the other beverages or amenities on course except that they really should have the sports drink before the water. Other than a few epic landmarks like the Brandenburg Gate and Kaiser Wilhelm Memorial Church, the course is rather uneventful, running through neighborhoods with rather tall (5-7 stories) and consistent buildings which provide very good cover from wind and sun. Standing around at the start, I wasn't cold which is typically bad. Thankfully the cover from the buildings and trees along with dousing myself with water from aid stations kept me mostly comfortable. As I mentioned earlier, the field one of the best assembled annually. It was inspiring to run with such a motivated bunch of kindred spirits. In fact, this brings to mind one of my favorite parts of the event, Saturday's "Breakfast Run." The official "Breakfast Run" is a 6km shakeout which is pretty much open to anyone and runs from Charlottenburg Palace to the Olympic Stadium. There were thousands of other runners from all over the world doing a casual, fun jog. Bring a costume or something with your country's colors and do the run! Just outside the Olympic stadium near the old parade grounds is a nice flat straightaway perfect for strides after the shakeout. If you're chasing personal records, this is a must experience event, even if you aren't able to PR, it's still fun to run the world record course with a bunch of other motivated athletes. If PRs aren't as important to you, I would say this is a decent destination event, but there are likely other marathons you may find better suited to you like NYC and London to name a few (I haven't run either event, but I hear the crowd support is deafening). I'm glad I went, but with Chicago Marathon in my backyard, I don't see myself going back for some time. "It's Mostly a Road Race..."
Be warned! I wouldn't classify this course as "very hilly," but it's pretty darn hilly and a decent chunk of the race is on crushed gravel which is not particularly fast (compared to asphalt). There are also a fair number of turns! Pair these factors with a humid, but thankfully overcast morning and sum is probably not a very fast half marathon time. That said, I do think this is a well run event. The aid stations were decent, the course was pretty well marked/staffed by police (a feat given the number of turns), and the pre/post-race environment was nice. There was no gear check in 2015, but there was plenty of free parking near the start line (about half a mile from the finish line) so this was a non-issue for me. I'm not certain I'll do this race again, but if you're looking into it, you should definitely consider it, since it's well run. Just be warned it's a tough race! Though I will say the benefit of being on the crushed gravel trails is that many of those areas are shaded and quite scenic!